Private limited companies are by far the most popular business structure. According to the Department of Statistics, out of the 26,555 business entities formed in 2018, almost 70% were companies. Why is this business structure so popular, and how does one incorporate a private limited company? This guide will address the advantages of a private limited company and explain the process of incorporating one. A private limited company is one of many business structures you could choose to adopt. It is essentially a small business entity which is privately owned by its members. In Singapore, private limited companies are governed by the Companies Act. Unlike a sole proprietorship which only has one member, a private limited company can have up to 50 members called shareholders. Shareholders own small units of the company called shares. These shareholders subsequently appoint directors to run the business on a daily basis. The shares of a private limited company cannot be traded on the stock exchange. Thus, if you ever intend to list and trade your company’s shares on the Singapore stock exchange (SGX), you must convert to a public limited company first. All companies must be registered with the Singapore Accounting and Corporate Regulatory Authority (ACRA). You may register your company either through ACRA’s online portal called Bizfile or engage the services of a professional filing firm to submit the application on your behalf. There are many benefits of incorporating a company. The first is liability. If you want to limit the legal responsibility that you are exposed to, a private limited company is suitable as it is thought to be a separate entity from its owners. This means that if your company were to ever become embroiled in legal and financial troubles, you would not be held personally responsible. Secondly, a private limited company is also able to obtain funds more easily, either from a bank, investors or by tapping on its owners’ contributions. Since private limited companies are considered to be more credible by banks, the banks are usually are more willing to lend capital. Furthermore, private limited companies would find it easier to raise capital as they can sell their shares to investors, who would prefer buying shares of a company rather than investing in a sole proprietorship due to the lower risk involved. Additionally, a private limited company’s owners can contribute funds which can be used to run the company. Since the structure of a private limited company allows it to have up to 50 owners, this means that there will be more owners who can contribute and this ultimately means that the company has a larger pool of capital it can utilise. Thirdly, a private limited company also has perpetual succession, which means that even if the owner has passed on, the business can continue operations until it is wound up or struck off the register. The ownership of private limited company can also be easily transferred in the form of shares which can be bought and sold with ease. On top of that, a private limited company in Singapore is regarded as a tax resident, meaning that it is eligible for local tax exemptions and incentives. For instance, for new start-up companies, the first S$100,000 of taxable income is exempt from taxes, and there is an additional 50% exemption on the next S$200,000 of taxable income (until 2019). All other companies are also able to enjoy partial tax exemptions. Furthermore, companies in Singapore are taxed at a flat rate of 17%, while sole proprietorships are taxed at progressive rates from 0% to 22%. This could be advantageous depending on the state of your business. Who can be a member of a Private Limited company? According to the Companies Act which governs all companies in Singapore, you can be a director or shareholder if you are aged 18 and above. Your company can have 100% foreign or local shareholding. However, a foreign member would first need to apply for an EntrePass from the Ministry of Manpower if he wishes to reside in Singapore and manage the business himself. Do take note that a P.O box address would not accepted. It must be either a physical office address or in some cases, a residential address is also permitted. If you wish to use a residential address, you will have to apply for Housing Development Board’s Home Office Scheme. This is necessary as all official letters and documents from the various government bodies such as ACRA and Inland Revenue Authority of Singapore (IRAS) will be sent to that address. What are the legal documents required to incorporate a company? Signed Constitution of the company. The Constitution is a consolidated version of the Memorandum of Association and the Articles of Association as well as certain provisions of the Companies Act. This document governs the relationship between the company and its shareholders. The Constitution must include a clause restricting the rights of its members to transfer shares. You can view the Model Constitution here. Signed Consent to Act as Director (Form 45) by each director. Signed Consent to Act as Company Secretary (Form 45B) by the company secretary. Minutes of the first board resolution meeting. What is the process of incorporating a company in Singapore? The incorporation process can be broken down into two main phases. The first phase is obtaining ACRA approval for your company’s name. The second phase is the incorporation of your company. How much does this entire process cost? According to ACRA, the basic costs incurred would include S$15 for name application and an incorporation fee of S$300. However, you may have to shoulder additional costs when you hire a company secretary and consult an auditor and/or lawyer. I am a foreigner looking to incorporate a business in Singapore, how do I go about doing that? First of all, you would need to engage the services of a professional filing agent such as a law firm, accounting firm or a corporate secretarial firm. 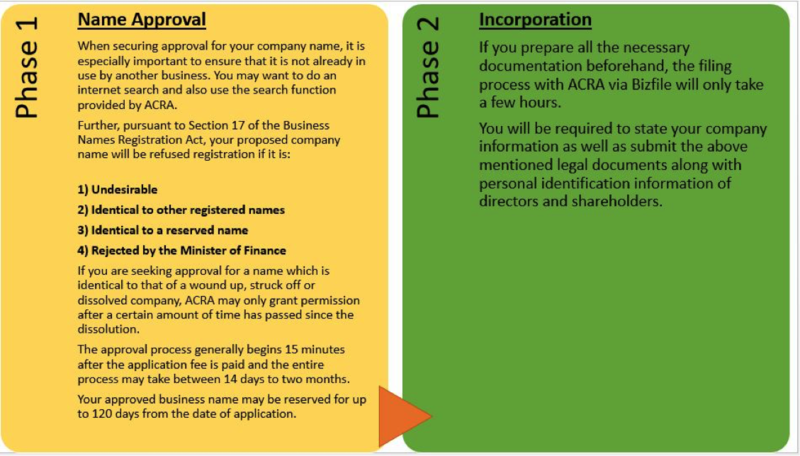 The application for incorporation is submitted via ACRA’s electronic portal and requires a SingPass or CorpPass which is typically unavailable to foreigners. Do note that you will have to appoint at least one locally resident director and have a physical Singapore office address. The application requirements and procedure for a foreigner are exactly the same as that of a company incorporated by a local. You will receive an email from the Singapore Company registrar confirming the incorporation of your company. It will contain your company’s Unique Entity Number (UEN), which is an identification number given to every Singapore registered entity. The email notification of incorporation and company business profile are sufficient in Singapore for all legal purposes, including the opening of corporate bank accounts, signing of leases, subscriptions to IT services, etc. You can also obtain the Certificate of Good Standing for a fee, which bears an electronic signature of the Assistant Registrar of ACRA to formalise the existence of your registered company. Your company name, date of incorporation, status and nature of business would be stated there. Here’s a useful checklist of things you need to do after you have incorporated your company. Open a corporate bank account. You may do so with any of the local or international banks. All of the Director(s) and signatories need to be physically present for the signing of paperwork most of the time. If physical attendance is not possible, certain banks do allow for signing at their overseas branches or at a Notary Public. Appoint an auditor within three months of incorporation. However, you may be exempted if your company has less than 20 individual shareholders, no corporate shareholders and the annual turnover is less than S$5 million. An auditor will examine your financial records and ensure that they are correct and valid. They can also offer advice which can help your business function more efficiently. Hire a company secretary who understands Company Law within six months of incorporation. The Secretary will share several legal responsibilities with the director and ensure that the company is being compliant with the Companies Act. Apply for necessary permits and licenses required for operation. Obtain an official company rubber stamp. You may also get an official company seal, if that has been provided for in the company constitution to officiate documents. File Annual Returns (ARs) within a month of your Annual General Meeting (AGM) as part of ACRA’s compliance requirements. AGMs are mandatory meetings held between the directors and shareholders to discuss the financial standing of the company. Newly incorporated companies are allowed 18 months from the date of incorporation to hold their first AGM. Besides the basic checklist of things, you may wish to take note of the following things to do in order to ensure a smooth operation. You should check if you need to obtain one or more business licences for your particular business activity. Licences and/or permits are required for restaurants, moneylending, educational institutions, travel agencies, liquor trade, financial services, import/export-related industries, etc. All Singapore businesses must also register for Goods and Services Tax (GST) if their annual taxable revenue is more than S$1 million, or are currently making taxable supplies and the annual taxable revenue is projected to exceed S$1 million. The deadline for GST registration is 30 days from the time it is deemed liable. Goods exported from Singapore and international services provided from Singapore are exempt from GST. The prevailing GST rate is 7%. It is also advisable to have a proper shareholders agreement (and accompanying employment agreement(s) where applicable) in place which contains the necessary dispute resolution clauses. This agreement defines the relationship and responsibilities of all members in the company. Having such an official agreement can come in especially handy when disputes occur. Have a question on incorporation? 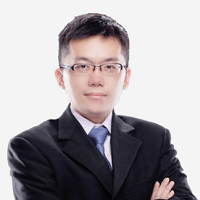 If you are in need of legal advice, you can get a Quick consult with Immanuel Lim or other experienced lawyers. With Quick Consult, from a transparent, flat fee from $49, the lawyers will call you back on the phone within 1-2 days to answer your questions and give you legal advice. This article is written by Immanuel Lim of Covenant Chambers LLC and edited by Rishika Pundrik of Asia Law Network.